Up to the end of the 19th century, some of the Mosel Rieslings enjoyed fame comparable with celebrated Bordeaux reds. The two devastating World Wars and following developments resulted in a decline in quality and so Germany started to be associated with easy-going semi-sweet whites like Blue Nun. From the eighties onwards this almost ruined its reputation…Since then the quality dramatically improved and the valley of Mosel offers us again some of the most splendid white wines in the world. what you can uncork today! There is a wine region defined by a snake-like river – dark and shiny – twisting through deep green forest and fresh green vineyards. The houses of a little, picturesque town remind partly of Alsace and Southern Germany for they tend to be half-timbered, and partly of Britain for their charming greyish or brownish stone. This romantic description refers to the valley of Moselle, in German Mosel, after which the wine region is named. Mosel, possibly the best known (and still too little!) German wine region, stretches from the border with Luxembourg to the city of Koblenz, where Moselle flows into the Rhine. In the old town of Traben-Trarbach – once a thriving wine commerce hub – I’ve discovered the wines of Martin Müllen. He’s numbered among the best winemakers in the region and, as a matter of fact, made it to the great World Atlas of Wine by Hugh Johnson and Jancis Robinson; though he barely spends time for all that networking and marketing stuff one could perceive as necessary for a successful winemaker. The quality speaks for itself. Here, like in many other parts of Germany, the dominating variety is Riesling, which once ennobled the local wine making. 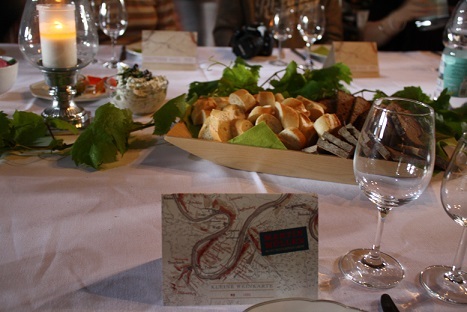 Up to the end of the 19th century, some of the Mosel Rieslings enjoyed fame comparable with celebrated Bordeaux reds. The two devastating World Wars and following developments resulted in a decline in quality and so Germany started to be associated with easy-going semi-sweet whites like Blue Nun. From the eighties onwards this almost ruined its reputation as consumer preferences shifted. Since then the quality dramatically improved and the valley of Mosel offers us again some of the most splendid white wines in the world. Though, prices remain relatively low and a great value for money is what results from this – surely not long lasting – situation. 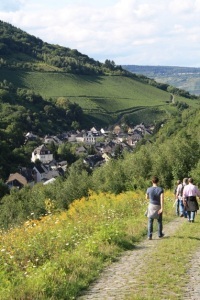 Mr. Müllen was among those young winemakers who tried to reverse that degrading development and regain the old good reputation for the Mosel wines. He has been even called a ‘fundamentalist’ for his attempts to bring terroir-driven wines back to the region. In his winery, gentle, over one-hundred year-old presses ensure that grapes have an opportunity to express their true character, and they are given lots of time to do so. As little technical intervention as possible is Mr. Müllen’s principle. 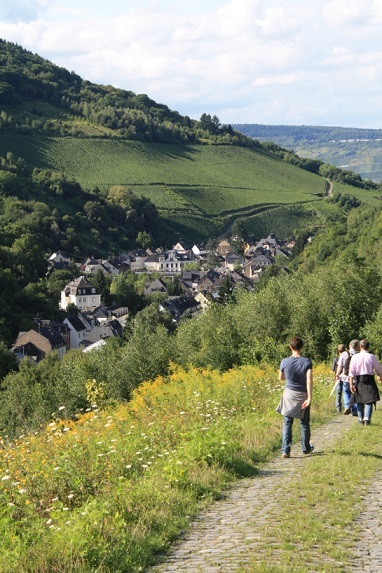 Furthermore, for a decade, he has also helped to preserve the steep slopes of Traben-Trarbach, a unique cultural heritage but also a telling example of biodiversity uniting wild and cultivated species. Unforgettable were all the Late Harvest wines (German: Spätlese): the 2012 Kröver Paradies, which was defined as fruchtsüß, that is fruity-sweet, and elegantly united the delicate sweetness with freshness; the 2012 Trarbacher Hühnerberg Riesling Spätlese – a feinherb (≈ off-dry) creation reminding of candy and matching red meat or game, a result of long pressing process (decent tannins from skins) and maturation in wood; and the 2005 Trabener Würzgarten Riesling Spätlese – another masterpiece uniting sweetness and acidity, containing distinct black currant notes, so seductive! The last Late Harvest beauty was the feinherb 2011 Kröver Letterlay Riesling Spätlese, which proved to be truly vigorous and, as such, was paired with roe venison goulash and spätzle with Mirabelle plums. The long degustation (I have not named even a half of the wines) finished with 2003 Kröver Paradies Riesling Auslese “Abbi,” served together with plum strudel. The 2003 vintage offered at the Mosel overripe grapes, which produced wine perfect for long aging. 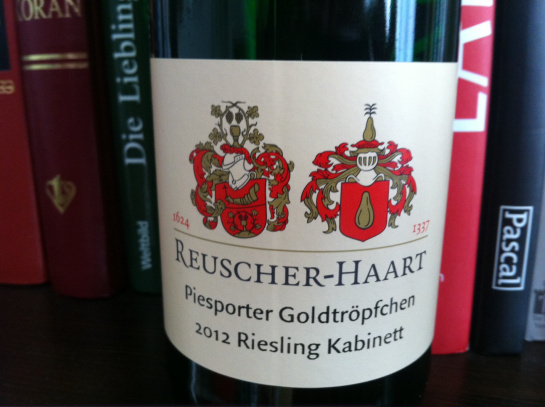 This one was creamy, dominated by the aroma of ripe strawberries, and manifested smart noble rot character. Traben-Trarbach was where I have heard for the first time a twisted version of an old German proverb – Was du heute kannst besorgen, das verschiebe nicht auf morgen (Never put off till tomorrow what you can do today) with the verb ‘uncork’ in exchange for ‘do’: Was du heute kannst entkorken, das verschiebe nicht auf morgen (Never put off till tomorrow what you can uncork today). Dear wine-lovers, following these wise words: cheers!